Paintball is a very popular sport that involves different teams or players shooting at each other with colour pellets shot from the gun. It is a tactical, extremely fun entertainment training sport. However, if you want to have the fun of this sports to fullest extent, you must need to own the best gears and one of those gears is a good hopper. Investing in the best and the right gears can be a huge difference and the deciding factor of how you are going to play in the paintball field. 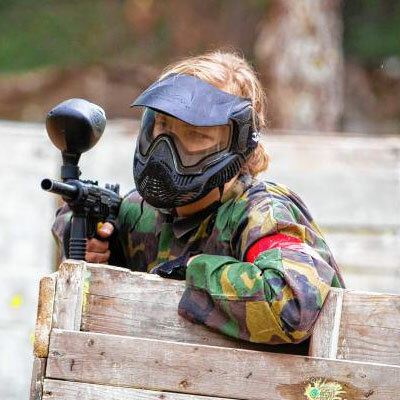 In this particular scenario, one important gear or equipment to invest in is the best paintball hoppers which can really influence your gameplay. Also known as paintball loader, the hopper is the piece of gear that you attach to your paintball marker or gun to carry the paintball pellets. It holds several rounds of pellets, the ones that tend to drop into your paintball gun just before firing it. Having the specific number of rounds in the hopper and to know it gives the player the opportunity to fire them quickly. However, remember that you can’t expect to find the best paintball hoppers in the business if you do not have enough relevant knowledge about it. For hoppers, there are many factors that you need to consider like the weight, size, type of hopper, capacity, firing rate and the color that you want and if you are buying a professional level hopper then continuous paint feed and precision are also very important that cannot be ignored. Your budget may also play a part in your choice but nothing too radical. As not all hoppers are the same, you need to spend time analyze and check out all your options in order to get the best out of it. By reading this article, you may be able to find the help that you need through the short reviews, FAQs and pros/cons of the following products. Each hopper review mentions the strength and the weakness and a little FAQ segment of the product, to help you make a better decision. The Proto Primo Paintball Hopper is one of the best gravity fed hopper and a largely considered choice, especially when you are looking for an affordable and reasonably priced option, it definitely works for those on a tight budget. One very good feature of this hopper is that it functions very well by sorting and funneling the paintballs down while you are shooting that results in a consistent vertical feed and great accuracy. This egg paintball hopper boasts a reasonable capacity, it can handle up to 200 balls. It Primo loader’s wide opening allows you to quickly feed the hopper without any kind of jamming. The positive shelf is basically designed to prevent stress on paintballs and prevent the breakage of pellets inside the hopper. This hopper allows users to enjoy the benefits of a higher feed rates. Furthermore, it ensures an easy reloading mechanism with the help of its clear spring lid. It is capable of shooting more than 8 balls per second. What we find even more impressive about the loader is that it does not require you to worry too much about a battery indicator or battery life because it is not an electric hopper but a gravity-fed one. Overall, this is a great gravity fed hopper within the budget and you should definitely check out this Dye Proto Primo paintball loader. Q: Does it tend to pop open? A: No, if you are not jumping or shaking it to the ground. Q: Does it fit on a Planet Eclipse Etha? Q: Does it fit with a speed fit? Q: Is this a full auto hopper? Q: What caliber does it use? If you are on a budget and want a quality hopper, this is a convenient choice for you. This is one of the most reliable hoppers in the market. Basically, LT-R stands for the light rotor. If you are looking for an electronic type then we think that one of the best paintball hoppers option for you is the DYE LT-R electronic paintball hopper. Its reviews are also very positive on Amazon and all other websites. We find it impressive in the battery efficiency department, too. It is mainly because it only requires 3AA batteries to power it. Once the batteries are around, the hopper will be capable of providing more than 80,000 balls shot count. This hopper falls in the cheaper range yet delivers an incredible performance. The added fun part is that it is available in almost 14 different color combinations which makes it stylish as well. Also, it has a fairly new design, is lightweight and strong. It has an anti-jam technology and an easy release system to ensure flexibility while playing. You can also easily clean up and maintain it with just one push of a button and just by simply sliding the locking tab. Whether you are an expert or a beginner the Dye LT-R paintball hopper will serve you optimally. Q: Will this keep up with an empire axe pro? A: Yes, with no problems. Q: What kind of battery does this use? Q: Would it work with a gun that is not electronic??? A: Yes, this is made for .68. Comes with a fast fire rate. Comes with an LED indicator. Can be bought with a matching colour quick feed. Speed feed is sold separately. If you were looking for a gun with a fast fire speed then you can consider one of these as it fires 30+ balls per second. By the time you are done everyone will be splattered in paint. Our search for the best paintball hoppers most likely introduced us to the Virtue Spire. This is one of the more compact hoppers available in the market. 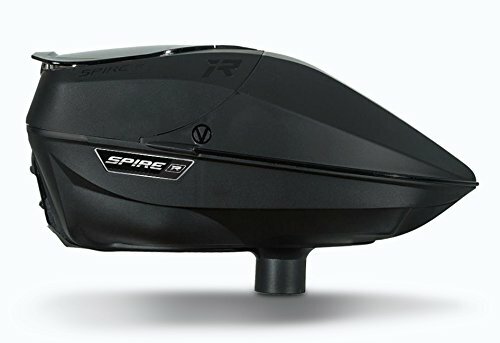 It is mainly because the Virtue Spire is one of the most reliable hoppers in the market, which continues to earn positive reviews and feedback from the majority of its users. 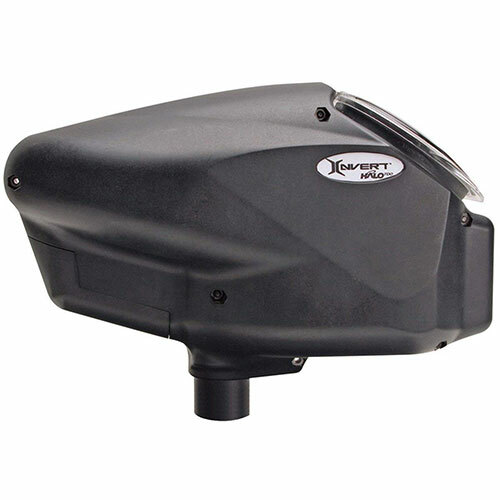 The Virtue Spire IR is a reliable unit that is small enough to be maneuverable. It weighs 1.2lbs and comes with sensors to allow continuous paintball movement. These 3-IR sensors have been upgraded to reduce pulsing and creating a quieter unit. The jam proof system allows you to feed 200/260 paintballs at a time no matter the texture of the paint. It also lets you enjoy using it without the risk of jams – thanks to the spring anti-jam drive integrated into it. It takes not more than 10 seconds to switch the crown feed to a rain lid. This one is available in 6 different colors. Strong nylon back shell is manufactured to bear harsh abuse on the playfield. Like the other spires it also never pulses or jams. So it continues the legacy of Virtue Spire hoppers. A flex cycle paddle also ensures that the paintball has a lower risk of breaking down. It is durable plus comes with a low and comfortable profile to prevent players from getting weighed down when using it. It performs best with a spring ramp. Q: Does the black one come a speed feed? 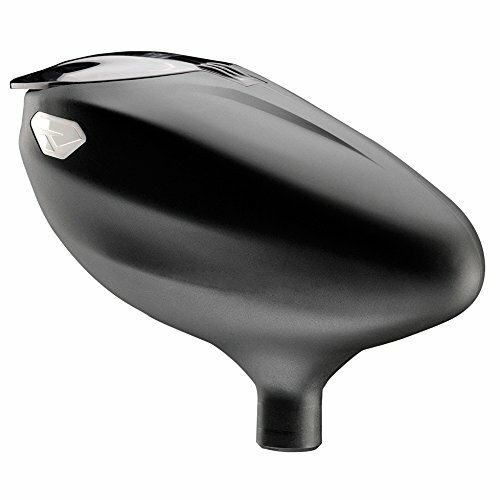 A: The 3 limited edition Spires come with crow 2.0 speed feed and the rest come with a matching rain lid. Q: Do they come with the back plate like they are supposed to?? A: It comes with everything an original spire is supposed to. Q: Does it come with a protective cases? Q: Will this fit the planet eclipse etha? Q: How many BPS can it feed? A: It can run 20bps with no problem. Comes with a durable nylon shell. Provides a battery life indicator. Features sensors for continuous loading. Small and light enough for easy movement. If you are looking for pure performance without concerning about budget, then this is the best paintball hoppers pick for you. The Empire Halo Too Paintball Loader is a high-end paintball hopper that has been dubbed by paintball pros to be one of the best values on the market. It is easy to use, so you will never experience complications when operating it on the field. It weighs 1.3lbs and comes with a 48ci 3000psi n2 gas tank to power the item. 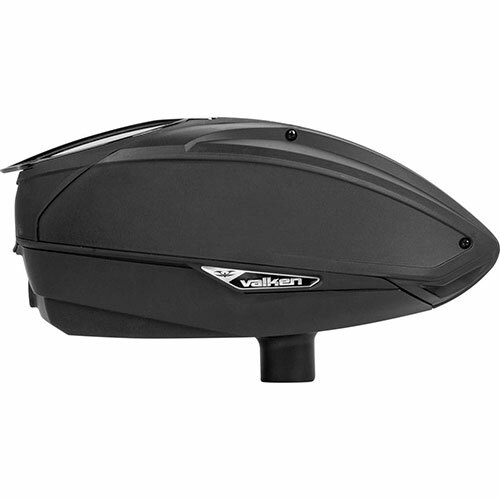 The lightweight unit is made from durable material so that it can be in use for longer. 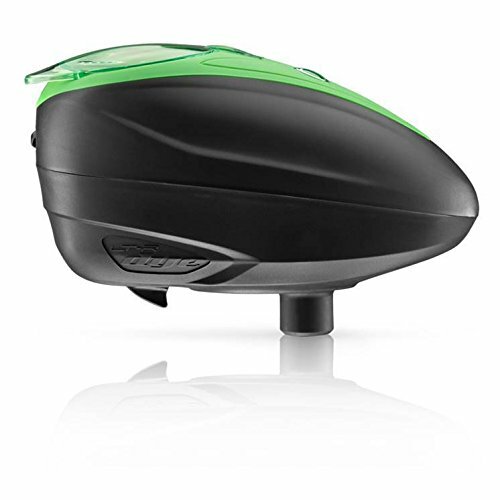 The hopper is made from polycarbonate which is able to handle impact and happens to be very easy to clean. Inside the unit is an electronic system that relays sound to facilitate continuous paintballs. We found out that it has a reliable force-feeding mechanism capable of feeding up to 20 paintballs every second. It also takes pride in its ultra-quiet belt. It can shoot at a speed of up to 180 balls. This is enabled by its FreewayTM Anti-Jam technology. It has an LED display and it shows alert messages through LED to indicate that the battery level is low. The shell of this loader is made up of a combination of several materials such as polycarbonate. The unit can fire 700+ rounds before needing another power source. You will also find that it comes with a 5-year hydro date and a limited lifetime warranty from invert. Q: How many shots before you have to change the batteries? A: The hopper lasts between 6000 – 10000 shots. Q: Does it need an e trigger to use it to its full potential? A: It uses standard .68. Q: Is this smaller than the halo v35? A: The Halo Too is the same size as the v35. Q: How many balls does it hold? A: The Halo Too has a capacity of approximately 180 paintballs. Comes with its own gas tank. The unit features an anti-jamming design. Shell is made from durable materials. Lightweight with a stable construction. Has an indicator to alert of current battery level. The Dye Precision Loader Rotor is a reliable and well-built paintball hopper aimed at providing fast loading speeds and adequate capacity. The blue- coloured product weighs 1/1 lbs. which are light enough to handle without getting tired. It was among the top selling electronic paintball loaders in 2018 so that self-explain why we added this in the list. First of all, this is based on the most radical innovation in paintball hopper industry. It comes with mind blowing feed rate and accuracy. You can totally rely on this mini paintball hopper and don’t ever worry about feed lag. Despite being lightweight, it still has the capacity of holding up to 200 rounds. It is endowed with a new rotor technology which makes it very easy to use. The loader can be disassembled and assembled very easily. We can also assure you that it will remain functional even if it is underwater because it has a water-resistant coated board. It has an impressively high feed rate, too. In fact, it can handle more than 50 balls per second. 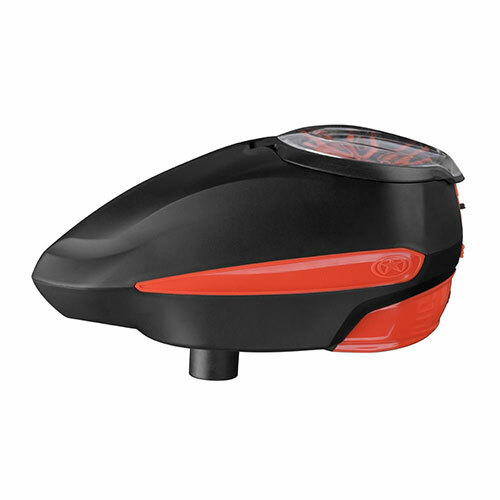 This paintball hopper features a patented design that allows 30+ balls per second if you are using 3AA batteries you can expect up to 100.000 shots before needing to replace the batteries. Another thing is the battery indicator that lets you know how much juice you have left. It will glow red when the unit needs a recharge. One more favorable advantage is its quick and easy reloading process. It even takes pride in its built-in transparent locking lid, which is a big help if you are looking for a more secure closure and a quick loading process. You can also easily keep track of the level of paint because of the see-through windows integrated into the paintball hopper. Q: Does it come with the quick feed in the box? Q: How many balls can it hold? A: 200 balls at a time. Q: Does it come with a case or cardboard box? Q: Is this sound activated? Q: What kind of batters does it run on? It has excellent reviews and is known to have such a long battery life that it almost never gets over even after multiple games! This is definitely an excellent purchase! Another impressive products in the paintball hopper category is this hopper from G.I. Sportz. The G.I. Sportz LVL paintball hopper is stylish and well-designed to handle all your airsoft needs. Its ultra-lightweight construction as well as extremely low profile. Such lightness and low profile makes the hopper easy to use and manage for beginners. This Mid-range unit weighs around 1.4lbs which would allow you to shoot accurately without obstruction and shaking of any kind. It is also very user-friendly ensuring easy movement between stations of the hopper. The hopper is made from durable nylon that enables it to withstand any impact. This unit also features adjustable speeds, you can decide whether you want a high, medium or low speed. The paintball hopper is able to deliver paintballs at the rate of 15+ bps. One more important advantage we can guarantee you is that it provides you with excellent options regardless of the weather – all hail to its rain lid. If you look at the unit you can see that it has a large capacity, able to contain 200 balls in a single round. Bundled with a large capacity and a jam proof drive system to avoid clogging, this s one of the best offers in the market. You will also get a rubber based feeding system and battery indicator to help you with the battery life span. The indicators reminds both visually and audibly to make sure you don’t end up with a dead battery. The paintball hopper is very easy to disassemble for storage and requires 4 AA batteries to work effectively. Another fun thing here is, it boasts a tool-less disassembly. Q: Does the speed feed sag? Q: Does it fit all guns? This is one of the more high-end hoppers and delivers top-notch performance. The hopper is lightweight, weighing around 1.2 pounds. It has an extending capacity of 250 balls. The Valken Paintball VSL Tournament got its reputation for being among the only loaders that has the capacity to hold both .58 and .50 caliber. It can hold around 250 balls at a time. It has a shooting speed of a minimum of 20 balls per second that gives you the extra advantage. It is also compatible with all the different kinds of paints. It features pulsing motor which generates more gentle approach on fragile paint. It has a quick release system to minimize the time between finger action and the actual shooting which making sure of more precision and less reaction time. The paintball hopper needs 3AA batteries to perform optimally but the batteries have to be purchased separately. To make things easier for the users, this hopper comes with a quick switch lid for easy reloading and a quick-release shell for easier maintenance. 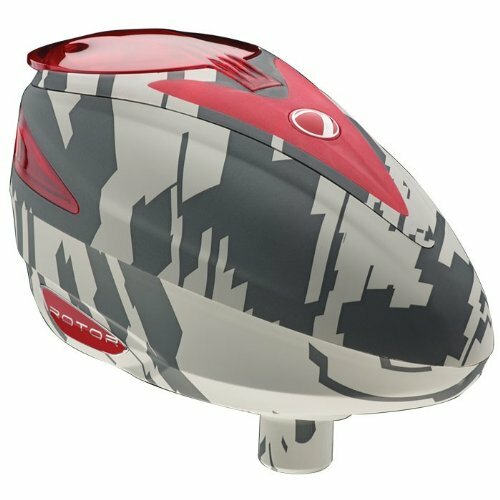 It is priced pretty decently and it is one of the cheaper yet one of the best paintball hoppers. The clamping feed neck ensure the stability of this hopper even when you run around. Q: What’s the caliber it can hold? Q: What’s the minimum shooting speed? Now as we are done with discussing about the products, let’s talk about the which will be the best paintball hoppers for you. Just like what has been said earlier, hoppers are not created equally which means that you really have to do a comprehensive hopper comparison in order to choose the best paintball hoppers for you. There are some key factors that you need to consider before buying a paintball hopper like size, style, durability, compatibility and fire rate. This buying guide here will help you to find out what to look for when buying a paintball Hopper. As we discuss previously, a good hopper should hold at least 50 paintballs. But if you are a more serious player, then you need to look for one the holds at least 100 balls. This will allow you to keep on shooting even when your opponents are reloading. There is actually no need for you to get the biggest paintball hopper you can find in the market. What you have to do is to look for one, which has just the right size. Larger sizes makes it possible for you to shoot even if your opponents are still reloading. The weight also matters a lot in your decision. It is advisable to go for lightweight hoppers. The size and weight of your paintball hopper can be a friend or an enemy as you battle. If you are carrying a large unit then there are chances that it will weigh you down. It is important to consider the size of the unit and the average number of paintballs you may need for a complete round. This is a very important question to ask when looking for a new hopper. It’s a vital consideration when you are still on the stage of shopping for a new hopper is the specific level of competition you are a part of. In case you are only an occasional player then it would be appropriate for you to invest in a hopper for beginners, which is not only reliable but also simple to use. If you only play every once in a while, you would probably be safe with getting yourself a beginner level hopper. One the other hand, if you are a die-hard paintball player who is taking part in competitions around the country then you will definitely want a high-end hopper. Such will provide you with the edge you want on the field while impressing your teammates and friends. If you are a serious paintball player, someone who participates in competitions, then a high-end paintball hopper is a must. Finding a compatible paintball hopper for your gun is important for optimal performance. If you have an older model then you might have to search more for a compatible unit. You also have to check whether your chosen paintball hopper is compatible with the paintball gun that you currently own. Before you go out and buy, always ask the company you are buying from if their hopper will fit your make and model paintball gun. This will help you avoid any costly returns and you will be getting a hopper that works well with your gun. If you are not sure you can always buy the gun and the paintball hopper from the same brand. That way you will avoid getting frustrated and losing money. It can also offer a guarantee that your hopper will really work with your marker. This one factor involves level of skill because how fast you pull the trigger may determine the model that you get. Simpler models especially the gravity loaded ones will have a slow fire rate as they lack paintball propelling mechanisms. At the other end of the spectrum, if you are just fine slowly shooting your paintball gun taking your opponents out one by one, then you might be just fine with a beginner model. The choice is really up to you. It’s an obvious feature to check for anything and a paintball hopper is no exception. Majority of hoppers are actually constructed out of plastic but such material varies from one type to another. In most cases, hoppers constructed out of clear plastic are usually weaker. Having a well-made hopper will provide you with years of enjoyment without having to worry about replacement. You can also find some models that are known for being more gravity-reliant. Others, on the other hand, force the paint via a rotary as well as down the neck. Ensure that the internal parts of these models can withstand drops and shots. The outer part should also be capable of protecting the insides. There are manufacturers who have made it a mission to provide durable paintball hoppers with thick dexterous material so don’t just settle for the cheap models that will break in a day. The key to a perfect hopper is to ask questions before you buy so that you will always be happy with the hopper you purchase. Hope this article will help you to learn about the top-rated paintball hoppers and determine yourself about the best paintball hoppers you should get.